Someone is knocking off the competition. Someone who can walk through walls, break down doors, fend off bullets, and break necks with a single “swoooosh.” Someone who, perhaps, is an expert in Karate. The futuristic sci-fi episode The Cybernauts is featured in the third week of our 52 weeks of The Avengers series. This one is quite a classic, in part because it introduces the audience to Dr. Armstrong, head of United Automation, who predicts that automated machines shall one day rule the world. The episode begins with a vicious attack by an unidentified assailant who is, apparently, unfazed by shots from a revolver and both barrels of a double-barreled shotgun. Steed arrives first and he’s soon joined by Mrs. Peel, who arrives on the scene wearing a tweed and fur ensemble. “Where the vultures gather,” replies Mrs. Peel. Steed sets out to learn more about a Japanese company that is building an advanced circuit system, which will enable ever-smaller advanced electronic devices. Meanwhile, Mrs. Peel pays a visit to a karate studio and asks to be admitted as a student. Sensai points out that fencing might be a more suitable means for Mrs. Peel to engage her competitive spirit. 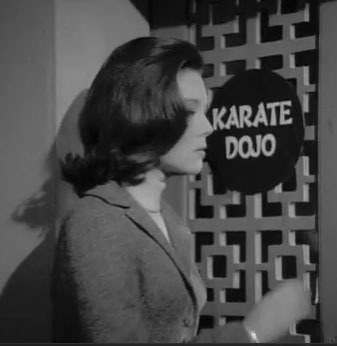 But Sensai permits Mrs. Peel to take on Oyuka, “the Immovable One,” a female karate master. If Mrs. Peel can get past Oyuka, she will be welcome as a student. Dr. Armstrong, you see, is wheelchair bound. At the end of Steed’s first visit with Dr. Armstrong, Steed’s cover is blown (but Steed doesn’t know this). Dr. Armstrong gives Steed a special pen that delivers a radio signal, enabling a programmable “Cybernaut” to track down and destroy. Possession of the “pen” (the signal”) tells the cybernaut who or what to kill. Steed doesn’t know this, of course, so he absentmindedly leaves the pen with Mrs. Peel when he sets off to infiltrate the headquarters of United Automation in search of more clues as to “how” the murders are being carried out. Long story short: Steed and Mrs. Peel prevail, of course, because the series continues. If you want to know the details, watch the entire episode. Cheers! Despite Dr. Armstrong’s prediction, we aren’t quite at the point where computers and machines control humans, but the day grows ever closer. In the meantime, Mrs. Peel will encounter Dr. Armstrong again in The House the Jack Built, one of my favorite episodes.